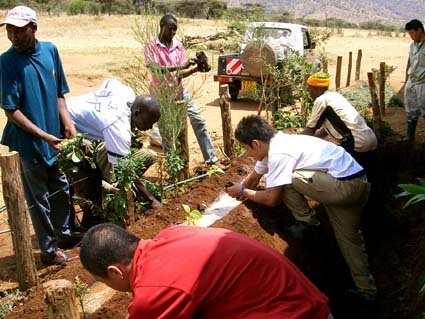 The course was held at the Ngare Ndare school with six Japanese students and two Kenyan students. The concept was to teach future aid workers from developed nations, using the course fees to fund local projects in the third world. Local students were selected to join the course. 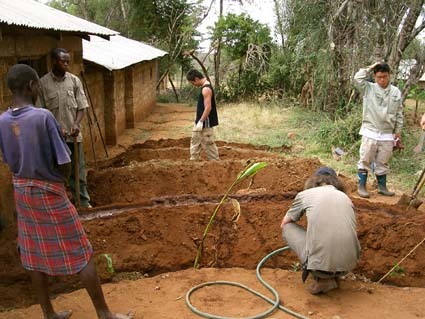 Other local people are employed to help implement the project. 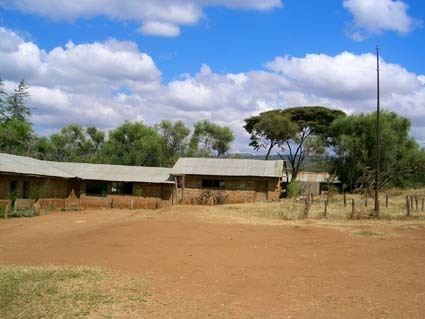 The school is adjacent to the Ngare Ndare Dryland Restoration Project and was the base for the course for the duration of the school holiday. It was also the focus of the efforts of the course. The school then had 460 students but a “free lunch” program promised to increase the number significantly as many local students walk 14 kilometres each day to another school which offers free lunches. 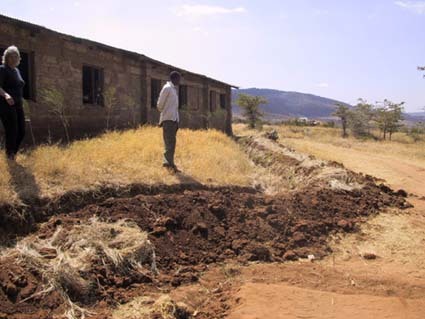 The school was fenced from goats about two years earlier and some swales had since been installed to try to stabilise the soil. This is a direct application of the technology used on the adjacent project. 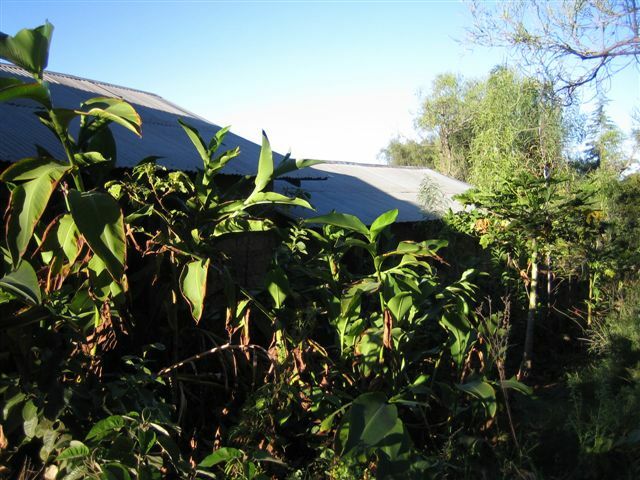 Generally the grounds were being improved but it was decided by the course teacher, Jeff Nugent, that with careful planning and directed effort, a Permaculture Food Forest could be established at the school requiring minimum maintenance but abundant produce. 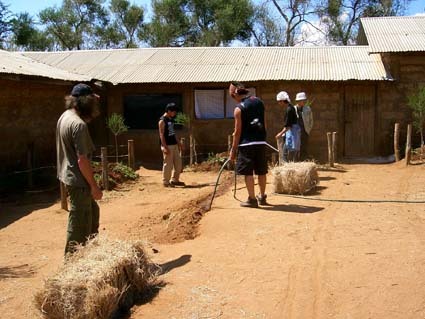 As the course was taking place during the dry season it was impractical to show students earth-shaping techniques in the field. 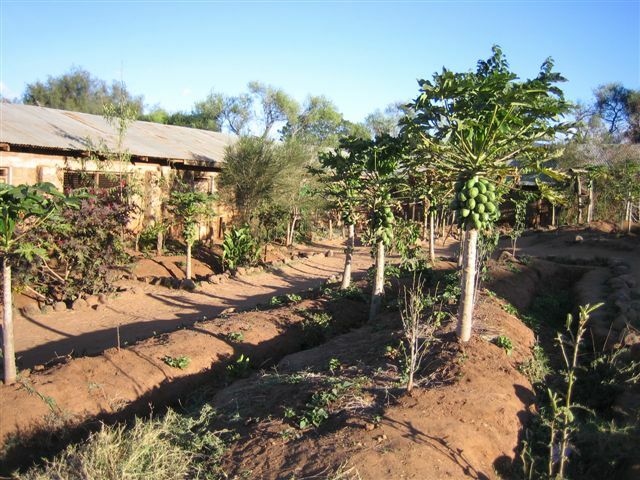 The school however had a water supply from the Ngare Ndare River so the soil could be watered to make digging possible. 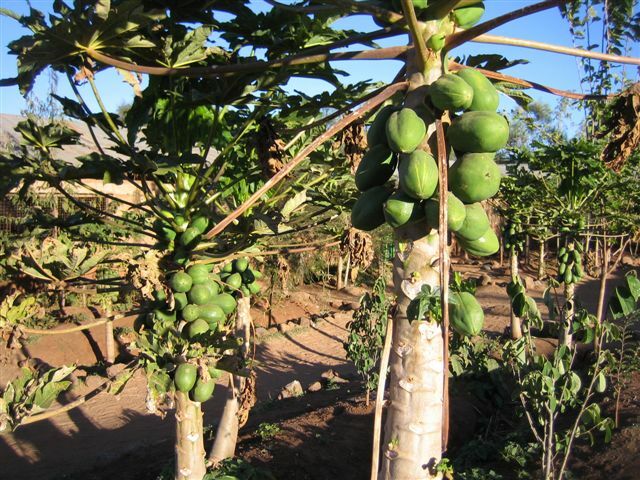 Some plants were donated by Borana Ranch and Kisima Farm while others were purchased from two local nurseries. The emphasis was on fruit and vegetables to provide nutrition for the students of the school. Japanese course students were from Tottori University, Nagoya, Japan. 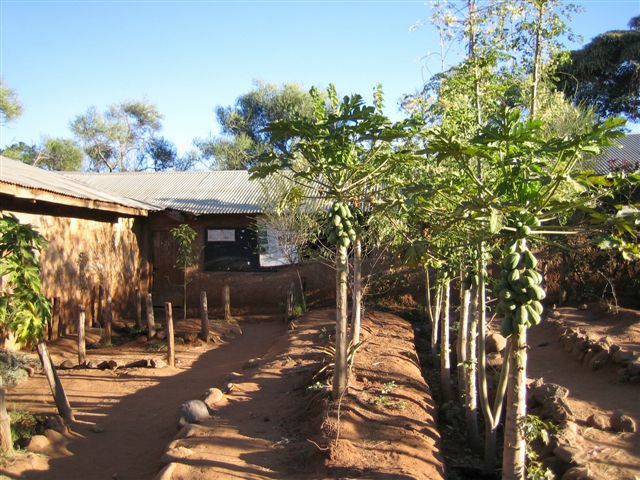 One Kenyan student was John Kariuki, the caretaker of the adjacent Dryland Restoration Project and the other was Patrick a fifteen year old senior student of Ngare Ndare School, selected for his interest in the project and his leadership skills at the school. 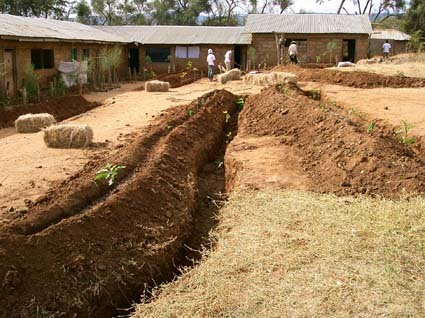 In learning to identify problems and turn them into solutions, the students built large swales under the eaves of the school roofs. 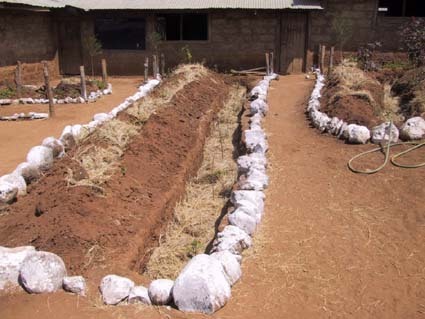 This would reduce the amount of water muddying the pathways, reduce the amount of soil erosion from the water-flow and retain the important water-resource in the soil for the benefit of the food-forest. 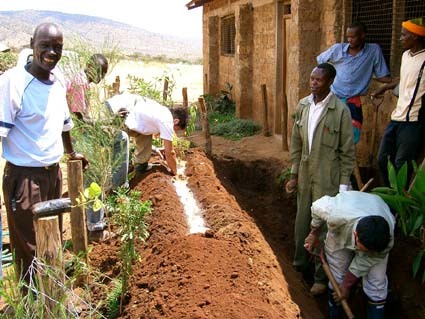 To facilitate ease of watering, a trough was placed along the top of each swale. Species were then planted at the level of the swale where they were likely to best perform. 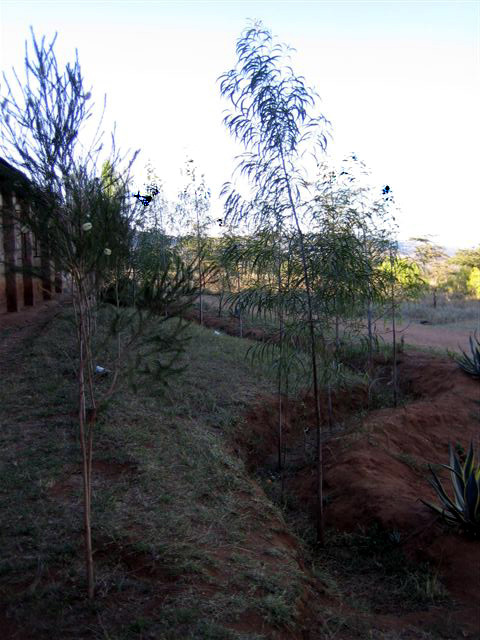 Some experiment was built into the planting also. In studying human movement the students identified areas of the school which, although being walked over, were duplicating other paths. The path system was rationalised freeing up a large amount of ground for gardens. Above: left, the paths are marked and water is being applied to make the soil soft enough to work. Right, after the swales were finished the school students each collected several large rocks and placed them as borders. Using lime whitewash, they then painted them white as a temporary reminder to be careful. The whitewash would only last until the rains. Below: The same garden 18 months later. Note the shaded walks are beginning to kick in. Hiding behind the Papaya in the swale is Moringa oleifera, the drumstick tree. The seeds are crushed and added to contaminated water to purify it for drinking. See More About This Plant. Special thanks to Michael Dyer for sending Feb 2006 pics.